This is a great collection of recipes, featuring traditional favorites and more creative dishes to vary your Passover feast. There are many recipes from well-known food writers and chefs, all suitable for Passover. Many of the recipes will be appealing year-round, and, needless to say, you don't have to be Jewish to enjoy them! 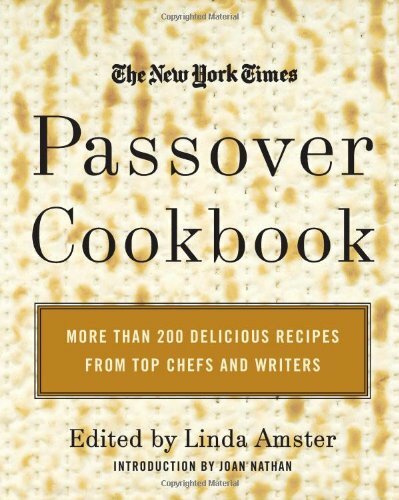 At last, from the paper of culinary record, comes a treasure trove of more than 200 recipes that celebrate the delicious festivity of the Passover table. Compiled from Times articles spanning almost fifty years, The New York Times Passover Cookbook represents Jewish cuisine from all over the world. It contains family recipes that have been passed down for generations as well as innovative kosher cuisine from such celebrated chefs as Wolfgang Puck and Alice Waters. Acclaimed Times writers Molly O'Neill, Ruth Reichl, and Mimi Sheraton have all contributed essays on the different ways that the Passover experience has enriched their lives. Recipes from Craig Claiborne, Mimi Sheraton, Molly O'Neill, Marian Burros, and Florence Fabricant are also included, allowing the reader to see -- and taste! -- how the experts at The New York Times cook for Passover. With dozens of fantastic main-course dishes for both meat and dairy meals, you'll have a tough time deciding between the Shad with Pineapple-Rhubarb Salsa and the Braised Moroccan-Style Lamb with Almonds, Prunes and Dried Apricots. Maybe this year your guests will savor a traditional dish like Chicken with Fresh Herbs and 40 Cloves of Garlic -- or perhaps something different, like Southwestern Blackened and Braised Brisket of Beef or Paul Prudhomme's Veal Roast with Mango Sauce. The chapter on Vegetables and Salads contains an ample selection of memorable side dishes: Carrot and Apple Tsimmes, Butternut Squash Ratatouille, the Union Square Cafis Matzoh Meal Polenta, and Beet Crisps are just a few of the flavorful recipes you'll want to enjoy all year round.